Heads still hazy from the night before, a week of excess, and the lure of a fancy dress event. This year starting earlier to allow for more people should they turn up – twenty riders took part in this year’s VC Melyd & Rhyl CC Brass Monkey Time Trial. Nine miles of joy, four celsius, damp roads, and first time riders. Twenty Seventeen is under way. So here we are ploughing through the Time Trial season – and I keep posting the results – however – there is a VC Melyd and Rhyl CC time Time Trial League no less. Yes. First place is awarded 30 points, and then each place after first gets a point less. These are added together. ….What do points mean? Prizes! So on those obscure nights, when the weather looks too hot, too cold, too wet – get out there, go get the points – gotta catch ’em all! 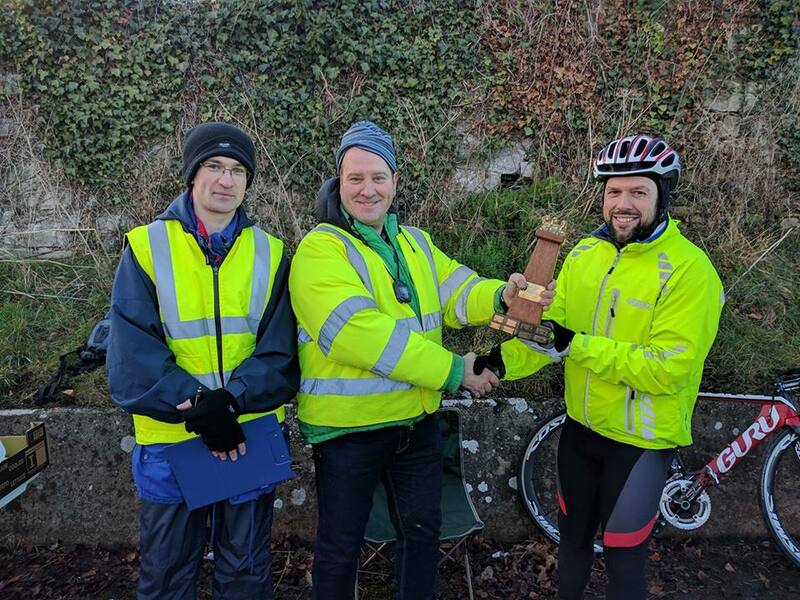 Well done to everyone – and to so many VCM riders for taking part in the league. Particular congratulations to David Griffiths and Sally Cunliffe for fourth and sixth place at this time! Huge congratulations to James Smith of Team Aspire on the win today. Many thanks to Simon, Mark, Chris, and everyone who helped make today possible. “The first race of the North Wales Road Race Series kicked off with a bang on Sunday 10th April. This race proved popular with the riders and reached its 80 rider limit more than 6 weeks prior to the event. 7.30am on a sunny frosty morning the Race HQ ‘The Centre’ opened its doors and the carpark was already starting to fill with riders and officials. VC Melyd setup the sign on tent outside and riders began to queue for their race numbers. 9.00am the marshals headed out to their allocated positions out on the circuit. There was a great turn out of marshals from both VC Melyd and local cycling club Ruthin CC. Riders assembled behind the convoy vehicles in the car park for their briefing. The 80 riders rolled out of HQ at 9.30 and on to the open roads under neutral conditions towards Llanfair DC. The flagged dropped on exiting Llanfair DC and the race had started. The peloton remained at a steady pace for the first couple of miles with no real attacks off the front. As the peloton reached the bottom of Nant Y Garth the pace increased with a few riders going off the front. As the race approached the top of the climb the majority of riders were back together and the race headed towards Corwen. As the riders completed the second lap the breakaway of 6 riders had 2 minutes on the peloton. The peloton pushed hard again on their final ascent of the Nant Y Garth and got within 50 seconds of the break before taking on the Horseshoe Pass climb to the summit finish. Jimmy Smith of Team Aspire attacked from the breakaway alone at the base of the Horseshoe Pass. *Particular thanks to Stuart for permission to use his images. Congratulations to Lucy Lee on her fantastic win at the Manchester Wheelers event “Women’s 2-day Stage Race“. Don’t take my word for it – check out the report at VeloUK. Lucy had the fine company of other VCM riders Janet Burthem, and Laura Ellis (also riding for Marsh Tracks Race Team) for the event, and Charlotte McKernon from local North Wales club Rhos On Sea CC. Huge congratulations on your win from everyone at VC Melyd Lucy, and to everyone who took part. Please join us in congratulating Janet Burthem on her 3rd place and podium spot in the final round of the British Mountain Bike Series this weekend in Cannock Chase. Chapeau. 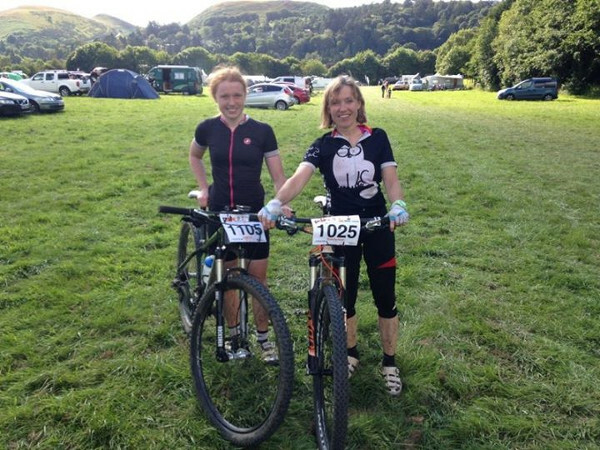 It was left to Lucy and I to represent Muddy Melyd at Marshbrook (75km) today, as the usual contingent saw 2700m of ascent and went elsewhere. All I can say is that we did manage to finish it. It made the Howies Dyfi Enduro look like a ride to work, and I now feel pretty much like I’ve just ridden The Marmotte. However as they said there was also 2700m of downhill and actually some of it was the steepest twisty descent through woodland I’ve ever ridden. Nice at 50km in. Lucy rode really well, although Alan Overson she now knows that half way feeling! I’m sure we finished somewhere near last, and I did fall down a hillside near the end when I waited for Lucy, put my foot down on fresh air off the path and fell sideways down a fern covered slope. I would have still been there now as Lucy didn’t see me and rode past, but a very kind man who panicked thinking I’d just disappeared down a precipice, stopped and pulled me out. Great day, you missed a treat lads. Last you say? Lucy and Jan both in around 6 hours 50 – impressive work!